Kang Yu-mi, who rose to popularity on the live comedy show “Gag Concert” around 2009, launched her YouTube channel in 2015. She feels that YouTube allows her to showcase herself as a more complex person. One significant advantage of the medium is the instant and constant feedback, the creators said. “I’m not overflowing with ideas, so I ask my subscribers for new ideas a lot,” said Kang. Kim Ki-soo added that he believes the global attention has shifted from K-pop to K-beauty. The creators also spoke of the palpable difference between traditional broadcast media and digital media. The types of content that “work” are entirely different, they said. Viewers prefer the more personalized content found online, she said, asking questions such as “What do these new spicy noodles taste like? How do you dye your own hair?” Content filmed in her own room with a minimal setup -- makeup tutorials, food reviews, daily routines -- fared much better, she noted. 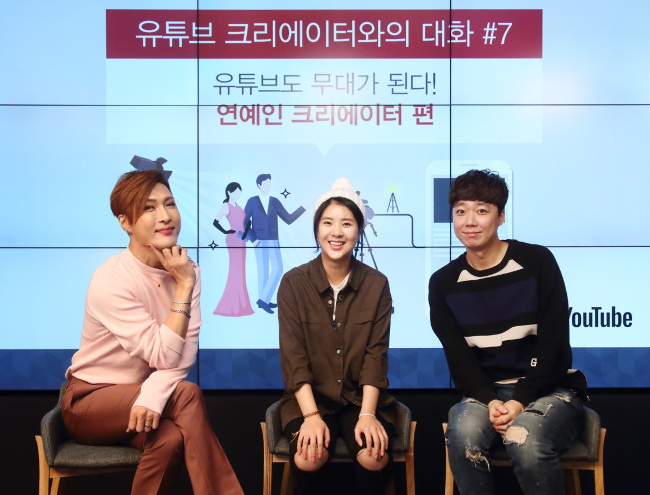 Kang says she now makes around 2 million won ($1,759) per month purely for the number of hits her videos receive. “Right now, it’s nothing compared to what I made in television,” she said. Meanwhile Kim Ki-soo, who will be launching a set of his own makeup brushes later this year, has grown much larger as a YouTube personality. The profits are “significant,” he said.